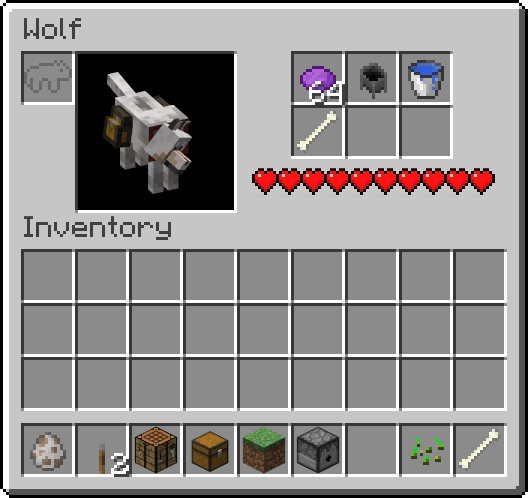 Adds new capabilities to wolves to enable tamed wolves to equip various armors and hold up to six items in storage. Right-click a tamed wolf with a chest in hand to add six slots of storage. Leather wolf armor is dyeable, just like normal leather armor! 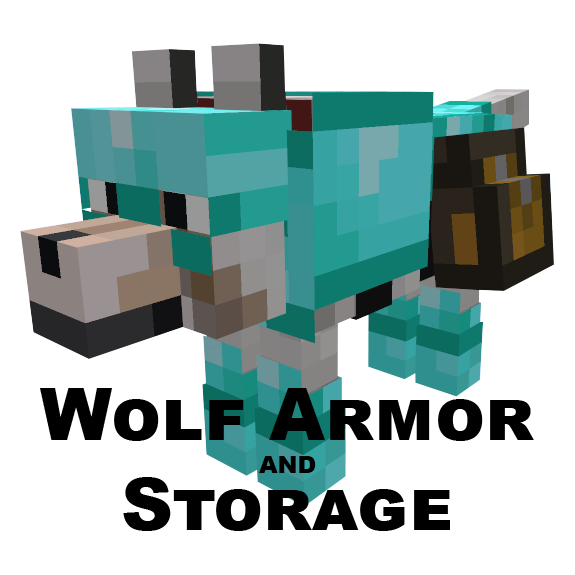 Apply wolf armor via dispensers! Each type of armor is craftable! API to register custom wolf armor types, chest types, etc. What is the compatibility status for Doggy Talents? The 1.10.2 alpha version should theoretically work, barring any odd functionality. Once I branch 1.12 it should work as well. 1.11 compatibility will also attain this "theoretical" status when the code changes from the 1.12.1 version get merged there. As for 1.7.10, not yet. I need to figure out how to rewrite that version of the mod so it functions closer to the Capability-enabled versions. ProPercivalalb contacted me a while ago regarding compatibility, so full compatibility should be present eventually. Yes. I may look into recreating this mod for Better Together once it releases, but I do not know what functionality that plugin framework offers as of yet. Is there an ETA for 1.12? I love this mod as my wolves do play dangerously when protecting me and I would like to take them with me more often on adventures and want to add it to my modpack. Stable release by next weekend for 1.12.1, backport to 1.12 more or less immediately after barring any catastrophic build failures. Why Won't It With 1.12 It's Been A While Since It Came Out? Um... How do i uninstall the mod? It would be awesome if this could be compatible with Doggy Talents as well! would this mod work with Doggy Talents or would there be any plans to help make this mod compatible with that mod? 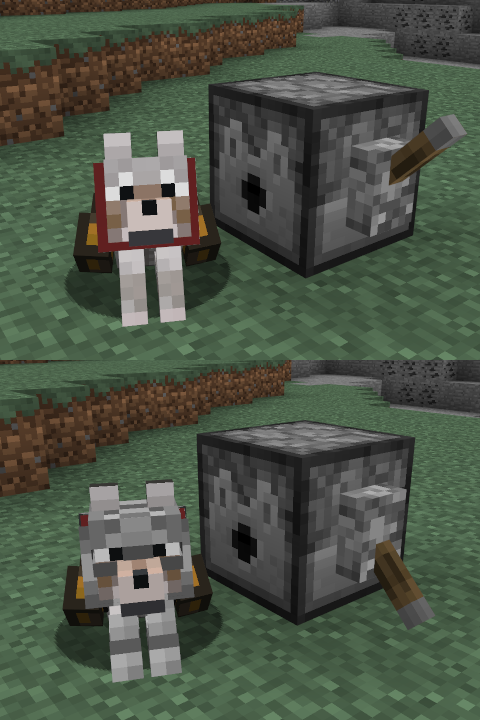 DoggyTalents appears to use a custom entity called EntityDog separated from the EntityWolf inheritance hierarchy. To add compatibility with that mod I'd have to extract some sort of API that can support multiple EntityTameable implementations, and then create some sort of compatibility patch or write a lot of conditional reflected code. Not to say it couldn't be done! The API thing is a future consideration already, so really it just comes down to that patch mod / reflection code. I can definitely add it to the list of considerations. How do i uninstall the mod do you know how? 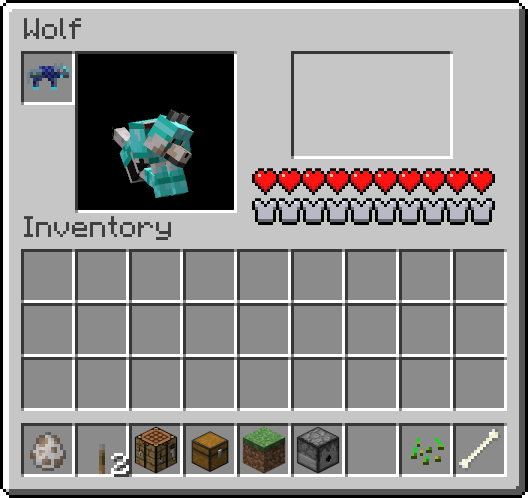 is the fix adding Sophisticated Wolves compatibility in the 1.11.2 version? The plan as of now is to merge the code changes past 1.11 into the 1.12 branch, then backport them to 1.11. 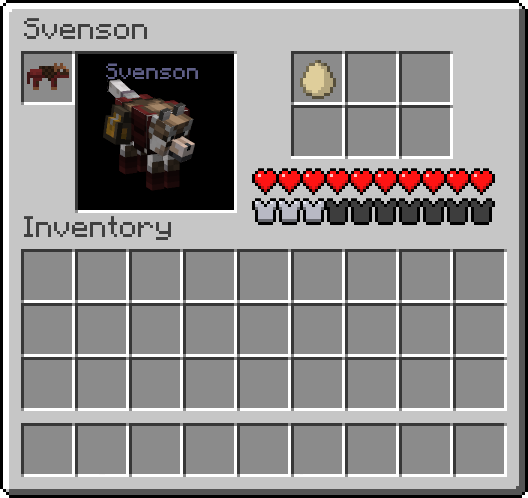 Currently I'm sorting out some incompatibilities with the horse inventories between 1.10 and 1.12, since I hijacked that class for use with wolves. Between moving house and work I've not had too much time to work on this recently, though I do now have a 1.12 branch in progress and hope to make some good progress this upcoming weekend (Jul 29-30 2017). How soon until there is a stable release of the update that adds compatibility between this mod and Sophisticated Wolves? Furthermore when will there be a version of that available for 1.11.2? Have to figure out the changes between 1.10 and 1.12's inventory systems. I've also just recently moved and haven't had too much free time between that and work. Currently limited to working on a single screen with a laptop, but hopefully I'll be able to make good progress this upcoming weekend.